A new Ashly ne24.24M Protea matrix processor with its modular I/O set up for 8-in/12- out forms the heart of the upgrade at the Coussoulis Arena. The 5,000-seat Coussoulis Arena is home to California State University, San Bernardino’s Coyotes basketball, volleyball, and other indoor sports teams. The arena also hosts spoken-word events, such as lectures and panel discussions, as well as music acts and performing artists of both regional and national status. Although the Community Sound-based system that went into the arena when it was built in 1995 served it well, an upgrade of the electronics a decade ago crippled it, rendering speech unintelligible and music boxy and lifeless. 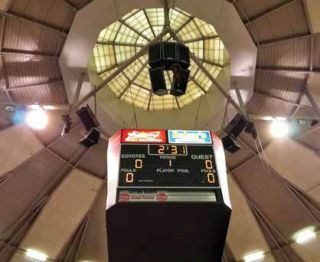 Without replacing the original Community loudspeakers, live sound and AV integration firm Simon Productions (Winnetka, CA) revitalized Coussoulis Arena with Ashly Audio processing, amplification, and user control.